Ray the Blind Dog: A New (Piano) Routine? I was dozing with a cat in my armpit. Kitchen noises were wafting up from downstairs where Gregg was preparing breakfast prior to preparing for work. All of a sudden there was a dog on the bed. Harvey, the armpit dweller, hunkered down a bit and hissed but didn't run. 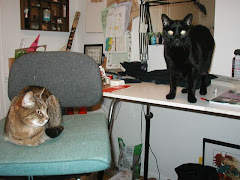 It was the second night of mainstreaming and both nights the cats had decided that this was the place to be. Ever since we got back from our marvelous vacation to England, Gregg and I have been allowing Ray to sleep on the bed with us. For the first couple of nights, he slept with us all night, then we realized that only the big dog was actually getting sleep. As in the past, Ray was once again relegated to the futon at night but allowed in bed weekend mornings or after Gregg is out of bed during the week. During the week, Ray launches himself onto the bed and snuggles up next to me (weekends he prefers Gregg). Ray's snuggling is such that usually more than half his body weight is on top of the snugglee, and most uncomfortable. But since I am usually up by 6:00, I figured I could suffer for a bit for my dog. However, this morning, when Ray heard the hiss, he curled in the spot vacated by Gregg. Harvey relaxed once again against my arm. He wasn't curled up, he was stretched out his full length from my armpit to just past my elbow. I was lying half spread-eagled on the bed; almost as uncomfortable as having half of a 70 pound dog 'snuggled' up to one's side. Juno had gotten up with Gregg. The night before she had made a nest in my hair and slept on top of my head. When she awoke in the morning and had started eating her nest, I objected. Offended, the roly-poly girl had headed over to her dad's side of the bed and left when he did. I heard her come back into the room and start climbing up the side of the bed behind my head. Harvey, looking for some sport, sat up to see if he could attack her as she breached the top. Ray's ears deployed, but he didn't stir. Juno's position as she accessed the top, was behind my pillow and totally defensible, Harvey lost interest and went in search of breakfast. The little girl cat traversed the width of the bed and curled up at the end of Gregg's pillow, an open expanse of bed was exposed where Gregg had thrown back the covers, Ray was sleeping on top of the comforter just beyond this. As Harvey left, Ray stretched full out across the bed. Juno looked alarmed at the movement but didn't duck and run. I reached a hand across the bed to stroke her calmly. As usual, Juno erupted into an ecstasy of purring, throwing her big-boned body onto the mattress, then standing and throwing her body down in a different direction, then circling and throwing, then rolling and throwing. Petting Juno is not so much a calming occupation; it is more a hilarious one. Through all of tossing and purring, Ray hadn't moved a muscle. Juno finding a nice bulkhead to throw herself against, threw her body against Ray's back. Still no movement from the big dog. Not finished with her ecstasy, Juno continued standing and plopping, standing and rolling, standing and tossing, always ending up against Ray. I reached out a hand and thumped Ray on the side, telling him what a good boy he was. Juno, seeing the hand for the toy it was, attacked. I yelped at the paw full of claws in my fingers. Ray raised his head in alarm. Juno, realizing for the first time that the thing that had been chasing her the whole day before was in bed with her, drew back. I thumped Ray again and told him it was okay. Ray yawned and relaxed. Short-attention-span Juno, once again drawn to the hand-toy, attacked. This time I pulled my hand away and let her sink her claws into the dogs big side. Ray never flinched. Juno enjoying the feel of the rock-solid, fur-covered body was moving her paws back and forth across Ray's side like she was playing a giant, spotted piano. Ray took it as long as he could then raised his head and looked over his shoulder at the little cat. What were you worried about....? Ray is clearly as much of a cat lover as his parents ! All sounds very cosy so far !! Except yesterday he was SO bad. Would NOT leave them alone and tried to eat poor Harvey. Juno is much better at hiding.